If you thought all the droning on about fuel economy and emissions was boring, try Ford's Fiesta 1.5 TDCi. Jonathan Crouch reports. If you find the automotive industry's current obsession with fuel economy, exhaust emissions and generally appearing to be greener than the Amazon rain forest an ideal cure for insomnia, then Ford's frugal diesel Fiesta, the 1.5 TDCi, may not be your kind of car. Efficiency-minded families though will prick up their ears at the thought of 88.3mpg combined cycle and a CO2 return of just 82g/km. Most people would agree that the moves being made by the automotive industry to clean up its act are important and largely laudable. Whether more could be being done and to what degree the car companies behind this drive to protect the planet are motivated by profit are moot points. Things are moving in a positive direction and cars like the Fiesta 1.5 TDCi claim to be in the vanguard. While we wait for hydrogen fuel cells, solar power, ethanol, chip fat, fermented onions or some other alternative to step convincingly into the breach currently occupied by fossil fuels, cars like the Fiesta 1.5 TDCi diesel are arguably amongst the best options we have. They're small, light and aerodynamic so they can be powered effectively by small, economical engines. The problem is that so many of them are so boring. We all want cars that are affordable and economical but wouldn't it be nice if they were fun too? This desire for some excitement to get our teeth into as a side order with our green vehicles could play into this Fiesta diesel model's hands. The 1.5-litre TDCi engine in this Fiesta won't induce Goosebumps when you plant the throttle, but it's reasonably punchy - even in base 85PS form - and it doesn't sound too gruff. As usual with a Fiesta, the best bit though is the chassis. Ford has a shining reputation for the driving dynamics of its cars and the Fiesta remains pretty near the pick of the back. It feels alive and fast in its responses, cornering with barely a flicker of body roll and more grip than the diesel engine could hope to overcome. Despite the Fiesta's infectious verve through the bends, it still manages to deliver a compliant ride when cruising, the suspension dancing over the lumps and knobbles of the surface. Some rivals are fractionally more comfortable, but there still isn't a supermini that's better to drive in its mainstream form than the Fiesta. There's a deftness to the way this car responds, an agility to the way it nips around the bends that no other small car can quite match. Rest to 62mph in the 85PS model occupies 12.5s on the way to 108mph. Go for the 120PS variant and the figures are 9s and 121mph. Expect to pay in the £15,000 to £17,500 bracket for the 85PS 1.5 TDCi diesel Fiesta - so you're looking at a premium of around £2,000 over the 70PS 1.1-litre Ti-VCT petrol model. Some will think that to be money well spent, given the better performance and the extra frugality you'll get. There's a choice of 'Style', 'Zetec' or 'B&O Play Zetec Series' trim levels for 1.5 TDCi 85PS model buyers. If you want the pokier 120PS version of this engine, you'll need to stretch to pricey 'Titanium' or 'Titanium X' trim, which means the need for a budget in the £18,000 to £20,000 bracket. Whatever your choice, you'll be offered some up-scale equipment options, examples including an openable panoramic glass roof. There's sophisticated safety too, including a Pedestrian Detection system that can even prevent collisions at night. And 'Active Park Assist' with brake interventions to prevent low-speed collisions when parking hands-free. As for standard equipment, even base models get features like air conditioning, Bluetooth, an 'Emergency Assistance' system and a 6-speaker stereo. Modifications designed to enhance this car's efficiency include variable geometry technology for the 120PS version - and sophisticated fuel injection that also enhances refinement. Smart Regenerative Charging enhances fuel efficiency by selectively engaging the alternator and charging the battery when the vehicle is coasting and braking. Plus there's a start stop system that cuts the engine when you don't need it, stuck at the lights or waiting in traffic. These tweaks apart, the driver is otherwise free to get on with enjoying one of the best handling small cars in the business. As for the cost of ownership results, well the 85PS version of this car's 1.5-litre diesel registers 82g/km and a combined economy figure of 88.3mpg; that's for the three-door model. The five-door variant is a fraction less frugal. If you choose the 120PS model, the figures re 88.3mpg and 89g/km. As for insurance groups, the base 85PS 1.5 TDCi variant is rated at group 8E, while the 120PS TDCi model comes in at group 14E or 15E, depending on trim choice. The push for more efficient cars is important, but it can also be a bit of a turn off. People will always be inspired by models that look good and can excite on the road, even if their heads and bank balances are lobbying for something economical. 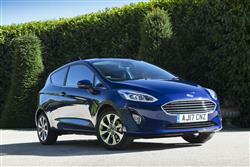 The Fiesta 1.5 TDCi does a fine job of compromise between these different criteria. It neatly demonstrates that outright pace and power are not essentials in an enjoyable driver's car, while managing to be one of the most fuel efficient superminis in its class into the bargain. Add in all the improvements made to the MK7 model Fiesta design and you've a strong contender.